Here are a couple of recent NOTD. 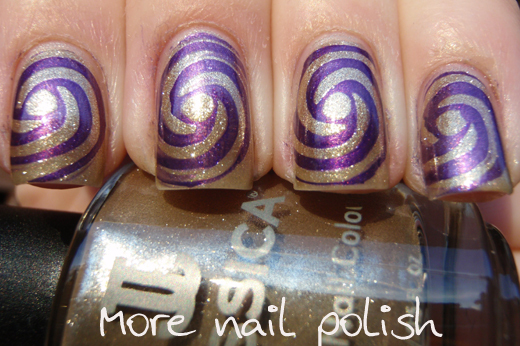 Jessica, Palladium - most definitely my most favourite sparkley platinum gold polish ever! I did have only about half of a tiny 5ml bottle of this left, until I saw a full sized bottle on blog sale at Vintage Musing of a Modern Pinup, and then Carly gifted it to me! Thank you so much! 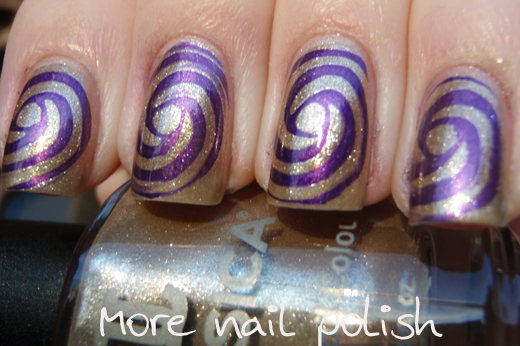 I had to wear it as soon as I got it, and here it is stamped with Ulta3 Orchid with a swirly design from the DRK-A plate. This next mani was a lucky dip. I put my hand into my untried drawer and was going to put on whatever polish I pulled out. 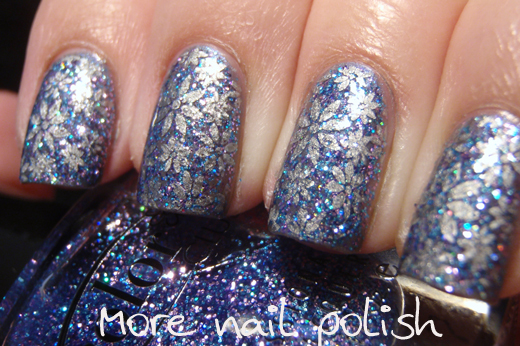 I pulled out Color Club Jingle Jangle from their Beyond the Mistletoe collection of 2011. I stamped this with a flower design from DRK-A plate using Layla Mirror Effect in Metal Chrome. I had much better luck using the Layla polish for stamping this time. Maybe the DRK-A plate is deeper than the other plates I was previously using and therefore the polish didn't dry too quickly, but I had no issues with picking up or transferring the polish at all this time. Love this, the second one is gorgeous. I have the Ulta 3 polish you used to stamp, I'm definitely going to try stamping with it! I think it'd look so pretty stamped over a pastel purple! Can I ask where the stamps are from? I LOVE the snow flake! I am loving the swirly design! omg i love the second design! glitter!!! 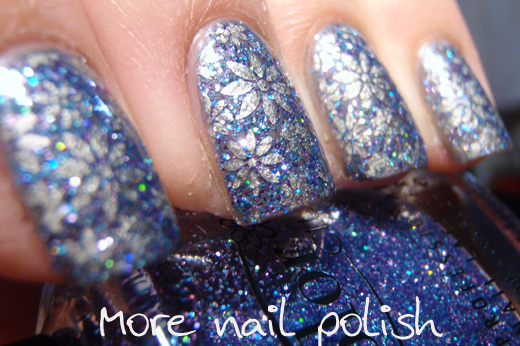 Love the stamping over the glitter polish! 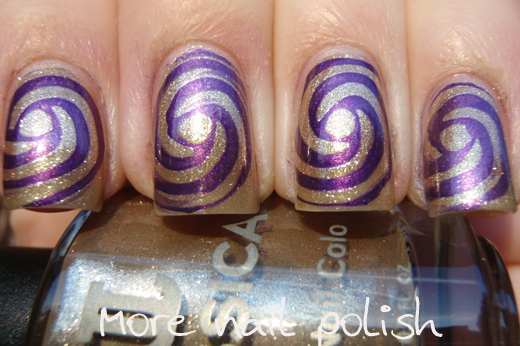 Absolutely love that swirl design! The creative nail design shellac is currently very hot favorite in the youth. The main reason behind this is the outstanding features that these shellac creative nail designs bring in to set your modeling mood.